If there was ever any doubt that Apple was serious about making a splash in the world of gaming, then the launch of its new online social gaming service Wednesday should certainly put those doubts to rest. Apple just made playing iPhone and iPod Touch games with other people a whole lot easier with the launch of its Game Center application. Game Center, which arrived Wednesday with iOS 4.1, operates a bit like Xbox Live does for the Xbox 360. That is, it allows you to easily play App Store games against friends and, yes, even strangers online around the world. Not only does it connect you with other players, it keeps track of achievements you've earned within your games and your ranking on leader boards for each game. And it lets you compare your ranking and achievements against those of your friends. That's right, let the battle for bragging rights commence. I took Game Center for a spin and so far things are looking quite good. Fire up the application – the icon will appear on your iPhone's home page – and create a profile. Invite some of your friends to play along with you. If you don't have any friends currently playing, the service will match you up with strangers who also are playing the game you're playing. There are currently almost 20 games that make use of the Game Center functionality – games that range from free ("FarmVille") to $4.99 ("Touchgrind"). You'll have to first purchase these games individually and then use Game Center to connect, or connect from the game application itself. Among my faves at the moment are "Nanosaur 2," "Flight Control" and "Field Runners." But my hands-down very top favorite is "WordsWorth" – a word-creating game that is threatening to unseat my obsession with the Scrabble-like game "Words With Friends" (not yet compatible with Game Center). Yes, I have to admit I get no small bit of joy seeing myself sitting up near the top of the "WordsWorth" leaderboard (as of this writing any way). Apple has done a great job with its leaderboards and achievement tracking – letting you see where you stand based on daily, weekly and all-time scores. And Game Center lets you see where you stand in each game compared to each of your friends. All in all, the Game Center interface is sleek and easy to use. On the downside, it's not exactly compatible with all iDevices. Good to go: 2nd, 3rd and 4th generation iPod Touches, iPhone 4s and iPhone 3GSs. Yeah, that's right, the iPhone 3G is not on that list. Not cool, Apple, not cool. Meanwhile, Andrew Podolsky, editor-in-chief for iPhone game review site Slidetoplay.com, points out that Apple is jumping into the online gaming fray a bit behind on this one. 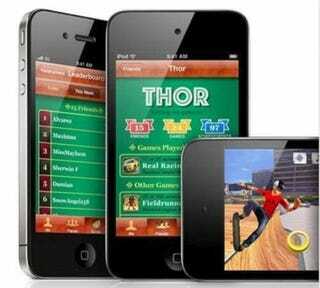 Services like OpenFeint and Plus+ had already stepped in to offer iPhone gamers that online interaction and competition they were looking for. "Apple has the potential to change the way people play games on the iPhone but they're also behind in terms of feature sets," Podolsky told me during a recent interview. "OpenFeint, for example, lets you import friends who also follow you on Twitter or Facebook, while in Game Center you have to manually invite your friends one by one. In some games, OpenFeint even allows you to watch a replay of a high score run, so you can see for yourself how someone played the game." But he also points out, "Openfeint and Plus+ are never going to have every single game supporting their service. They are different competing services. Game Center is the only one with potential to draw in every single game." Though only a few games are currently available for Game Center connectivity, Apple has promised that's going to change in the coming days and weeks. And Podolsky points out, "The fact that Apple is putting its weight behind it and recognizing the importance of gaming on the iPhone really gives us a lot of hope for the future of this platform." Winda Benedetti writes the Citizen Gamer column for msnbc.com. You can follow her tweets about games and other things right here on Twitter.